A comedy-drama that taps into baseball's rich vein of nostalgia, A League Of Their Own touches all the right bases and scores a resounding victory. 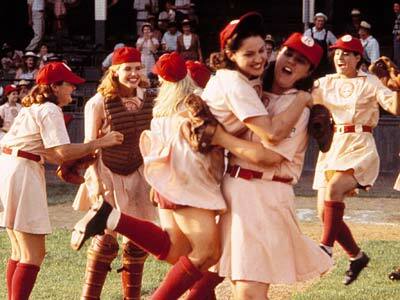 Weaving a fictional story based on the true events surrounding the formation of the All-American Girls Professional Baseball League during the Second World War, director Penny Marshall expertly keeps the focus on the human drama and allows the baseball to simply provide a rich canvass to paint on. It's 1943, and with star baseball players heading out to war, the idea of a women's league is hatched by baseball's governors and their industrial backers, and a recruiting program is launched. Sisters Dottie (Geena Davis) and Kit (Lori Petty) are competitive amateur players and dairy farmers in Oregon. Dottie, a catcher, is more attractive, more confident and a bit better at everything than the scrappier Kit, a pitcher. Spotted by a continuously wisecracking scout (Jon Lovitz), the sisters travel to the league tryouts in Chicago. Dottie and Kit are selected to play on the Rockford Peaches, one of four founding teams, along with the unattractive but powerful switch hitter Marla (Megan Cavanagh), the flirtatious "All The Way" Mae (Madonna) and the competitive and opinionated Doris (Rosie O'Donnell). A former beauty queen and several housewives, many with their husbands fighting the war, make up the rest of the team. The inaugural coach of the Peaches is Jimmy Dugan (Tom Hanks) a former big leaguer, but now a confirmed drunk. Dugan initially takes little interest in coaching the team, allowing Dottie to fill the void and provide leadership as the league struggles to attract attention. But attendance and interest pick up when the league starts marketing the flamboyant yet elegant Dottie as the Queen of Diamonds, and Dugan finally accepts the responsibility of managing the team. The Peaches need to overcome various conflicts during their first season, not least of which is the simmering rivalry between Dottie and Kit. To borrow a sports metaphor, A League Of Their Own benefits from actors who accept their role on the team, none more so than Madonna thriving in a supporting role and delivering one of her best screen performances. Geena Davis, one year on from her triumph in Thelma and Louise, carries the main role with an intriguing combination of steel and grace, allowing Lori Petty the showier and edgier role of the younger sister who needs to try harder just to get out of her sibling's shadow. Tom Hanks makes an impact in a relatively small role as Jimmy Dugan, but gets to deliver, with perfect exasperation, the classic "Are you crying? There's no crying! There's no crying in baseball!" line. Jon Lovitz as the scout Ernie Capadino gets nothing but an endless stream of sharply sarcastic lines to spout ("Are you coming? See, how it works is, the train moves, not the station. "), and the only shame is that his role is too small. 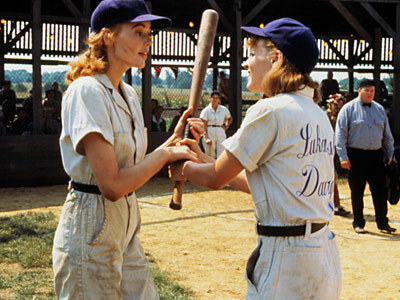 A League Of Their Own captures an idyllic American mid-west during the Second World War era, with the Rockford Peaches covering endless miles of landscape on the team bus between games, and war-time patriotic posters on every wall. Bookending the movie with scenes of the elderly Dottie travelling to the opening of the All-American Girls Professional Baseball League section of the baseball Hall of Fame in Cooperstown, an event which turned into a player reunion, the screenplay by Lowell Ganz and Babaloo Mandell strikes the perfect balance between drama and comedy. None of the comic moments are crass, and equally, most of the serious scenes avoid the descent into melodrama. This is a story of ordinary girls embarking on an amazing, life-changing adventure by simply playing the sport that they love under extraordinary circumstances, and A League Of Their Own creates an extraordinary film out of their experience.